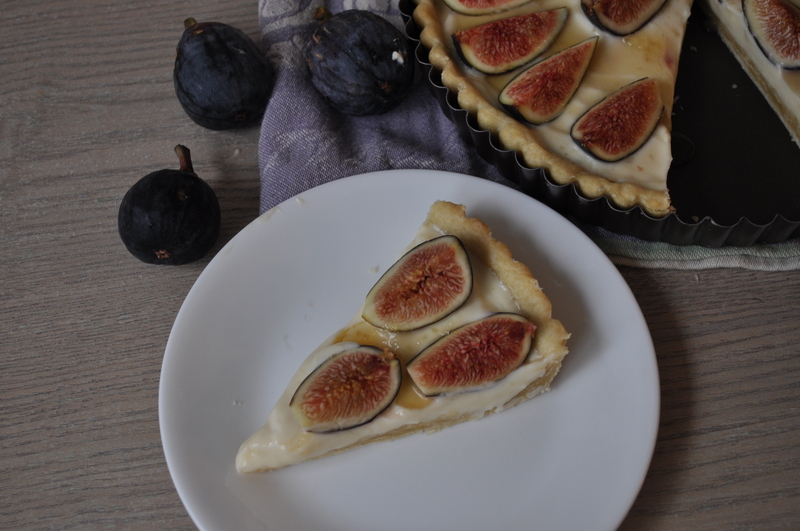 As promised, here is the beautiful fig tart recipe courtesy of one of my favorite cookbooks, The Winemaker Cooks. If you’ve never checked out this book, I would highly recommend it. It’s beautiful enough to be a coffee table winner, and the recipes themselves are fresh and delicious. Now back to this lovely tart. Would you believe this was the first tart I’ve ever made?! Seriously, I had to go out and buy a tart pan and everything. Turns out it’s even easier than making a pie since you don’t have to do all that crimping and prettying up. You just lay the extra crust over the sides, then run your rolling pin over the top, et voila! I also love any reason to pull out my rolling pin – it just feels so retro chic, like I should be cooking in heels and pearls. So not only was this tart fun to make, but it also makes for a rather impressive dessert. The figs do all the real work since they just look beautiful on their own. And for some reason figs don’t seem to be the most popular fruit choice, which makes them seem all the more special. My brother-in-law had actually never eaten a raw fig before this! Get on board people, they are delicious! I will admit that I had a bit of a snafu the first time I made this, as I think there might be a typo in the recipe. It calls for a full teaspoon of salt, and since I was making this with my toddler, I was concentrating more on keeping his little hands out of it, rather than tasting it before I spooned it into the crust. End result was seriously salty. So I did what any enterprising cook would do – I removed all the figs, scrapped out the old filling, and replaced it with my refashioned version. The day was saved. Try this one out while it’s still warm enough to have you craving a cool/refreshing/light dessert. I’m off to New Orleans for a much deserved weekend with my college sorority sisters and some (hopefully) great Ole Miss football. Major thanks to my husband and in-laws who will be on kiddo duty! For Pastry: in a food processor, pulse flour and salt until combined, then add butter and process until it forms coarse crumbs. Add the water, 1 T at a time, until mixture just comes together. Remove dough and shape into a disk, then wrap in plastic wrap and refrigerate for 30 minutes (or up to 2 days). Remove the dough from the fridge and allow to soften for a few minutes. Roll into an 11-in. round, then place over a 9-in. fluted tart pan with removable bottom. Press dough into the sides, then run rolling pin over the top to remove excess dough. Place back in the fridge for 30 minutes (or up to 24 hours). Remove pastry from fridge, prick all over with a fork, then line crust with parchment and fill with dried beans. Bake for 20 minutes, then remove paper and beans and cook for another 5-10 minutes, or until just golden. Transfer crust to a wire rack and allow to cool completely. For Filling: in a medium bowl, whisk together the mascarpone, sour cream, and honey. Spread into cooled crust, then arrange figs on top in concentric circles. Remove from pan, and drizzle with additional honey before serving. 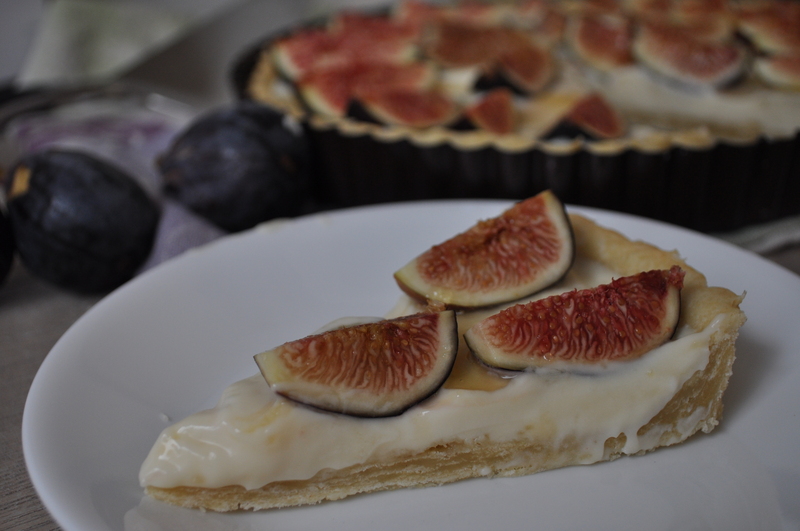 Posted in Recipes, Sweets and tagged dessert, figs, honey, mascarpone, tart. Bookmark the permalink.